A delicately hand woven sterling silver textile bracelet features designer Lois Hill's signature scroll designs in handcarved silver. 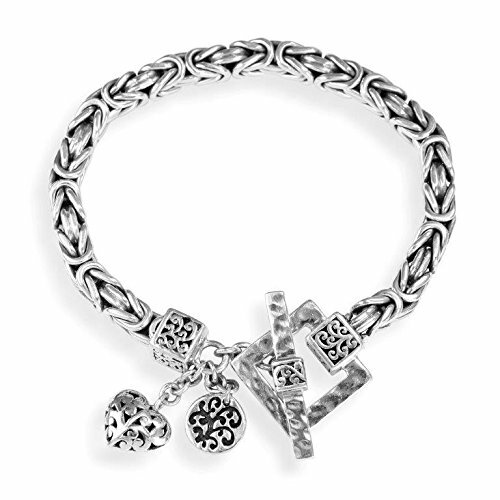 A piece that can be worn alone or dressed with other stacked bracelets. Due to the nature of our sterling silver product which is oxidized to bring out the texture and intricacies of each piece, we recommend avoiding jewelry cleaners or dips as they will remove the oxidation. Simply polish your piece with a polishing cloth as needed. If you have any questions about this product by Lois Hill, contact us by completing and submitting the form below. If you are looking for a specif part number, please include it with your message.